Just recent as June 2017, a CNN article proclaimed malls are doomed, predicting 25% will be gone in 5 years due to the increased popularity of online retailing. However, not everyone is convinced. In that very same article, Tom McGee, CEO of the International Center of Shopping Centers was of the opinion that there’s still a place for malls. "The occupancy rates in this industry are still a very, very healthy 93%," says Tom McGee, CEO of the International Center of Shopping Centers. "That's the ultimate sign of health. Although every store closure is painful, as a percentage of total retail square footage in this country, it's a very small percentage." Even if the way consumers use malls has changed, he said, there's still a need for them. "There clearly is competition that exists today that didn't exist in the past. But I do think the mall is still a social gathering place," McGee adds. McGee may have a point. Miami’s Brickell City Centre represents the evolution of the shopping mall as a mixed-use social gathering place. Developed by Swire Properties, Inc., the Brickell City Centre is a $1.05 billion mixed-use development strategically orcastrated to become a distinct lifestyle destination in Miami’s Brickell financial district. At it’s heart, is a 500,000 square foot, four level mall that may ultimately change the way new malls are designed and existing malls are retrofitted in the future. 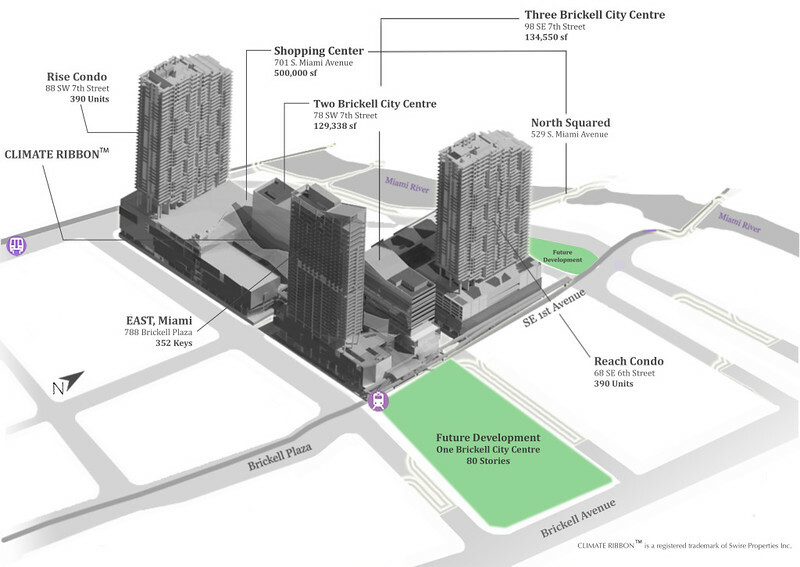 Opening its doors in late 2016, Brickell City Centre is everything your traditional shopping mall isn’t. As retail trends have undergone major shifts, developers are looking to maximize shopper’s experiences. Some traditional retailers, such as Macy’s, are even seeking to sell out-parcels to restaurants or car washes and convert portions of existing store space to office uses. With this in mind, Brickell City Centre is a modern example of not placing all your eggs in the same retail basket. Consisting of 120 spaces covering 500,000 square foot, the open air shopping mall contains a mix of luxury, international and traditional retailers, plus a handful of restaurants. In addition, the site includes 260,000 square feet of office space, 780 condominiums, 263 hotel rooms and 89 serviced apartments. For decades, large surface parking lots were considered major assets for shopping centers across the country. Now the idea of dedicating large amounts of acreage to non-revenue producing parking lots is being viewed as poor utilization of real estate holdings. Recently, REIT Kimco Realty executives estimated that 75 percent of the actual land space on its properties is occupied by parking lots, while retail accounts for 25 percent. As a result, the REIT is seeking to encourage more live/work/play projects on its properties. Figuring out how to maximize space isn’t a problem at Brickell City Centre. At full buildout, the entire 9.1 acre development will contain 5.4 million square feet of office, residential, hotel, retail and entertainment space above its underground 2,600-space parking garage. As the face of retail evolves, tremendous opportunity exists for the implementation of out-of-the-box concepts and creative retail strategies. This is especially important as traditional department stores like Sears, JCPenney and Macy’s continue to shutter hundreds of stores, sending the malls they anchor into a downward spiral. In order to innovate and improve the shopping experience, retailers and landlords are now blurring the lines between experience, retail and restaurants. According to Phillips Edison, a fully integrated real estate firm with a national platform of grocery-anchored shopping centers, by 2020, it is expected that there will be 200 Food Halls in the U.S., which is more than double the number we have today. 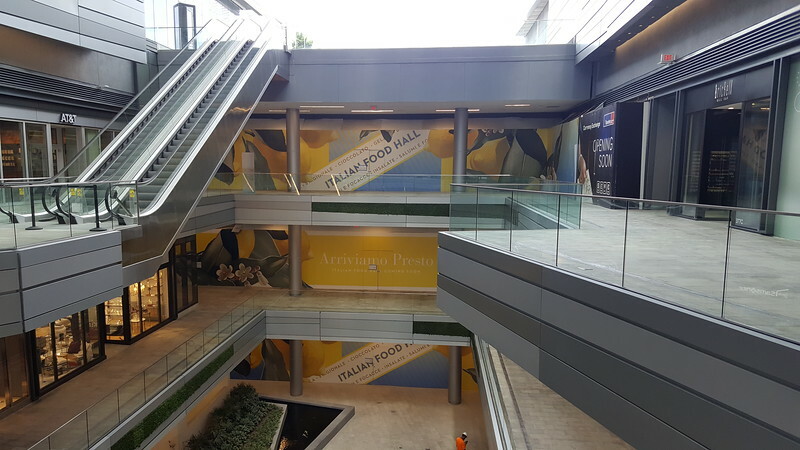 Brickell City Centre is an example of a mall that will be anchored by two food halls, as opposed to multiple traditional department stores. On the north end of the shopping center, La Centrale, will be a three-story, 38,000 square foot italian food hall when it opens by the end of the year. At the mall’s west end, Saks Fifth Avenue is in the process of adding the 17,630 square foot Casa Tua Cucina Northern Italian food hall on its first floor. The mall’s other anchor is Mexico-based CMX. Making its U.S. debut, CMX is a ten screen luxury movie cinema offering the crème de la crème of surround sound and hi-def screens, plush kick-back seating, waiter service, and delish gourmet treats courtesy of Biko chef Mikel Alonso. Being context sensitive applies to a lot more than just the design of streets that integrate seamlessly with the surrounding environments they serve. The proper integration of land use is an important element as well. 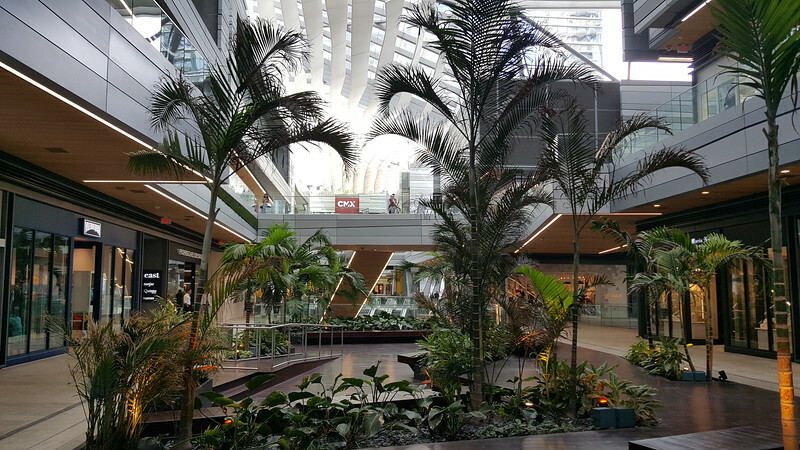 Brickell City Centre is a shopping center covering three full city blocks that is also integrated to fit with the existing urban street grid. Structurally, it is also designed to embrace South Florida’s tropical climate. Here, the open air mall includes an environmentally sophisticated Climate Ribbon allowing shoppers the ability to walk in comfort. The Climate Ribbon is a 150,000-square-foot overhang of steel, glass and fabric that shields shoppers from the weather and softens the sunlight. Through the use of computer models, it takes advantage of its location by utilizing Miami’s breeze to cool the center’s esplanade. It also captures rainwater for use in irrigation of its natural landscape. The world is quickly becoming a place where being multimodal friendly is a must among metropolitan areas seeking to remain economically competitive in the 21st century. When it comes to access, being located adjacent to transit lines is becoming just as important as being next to interstate highway interchanges. 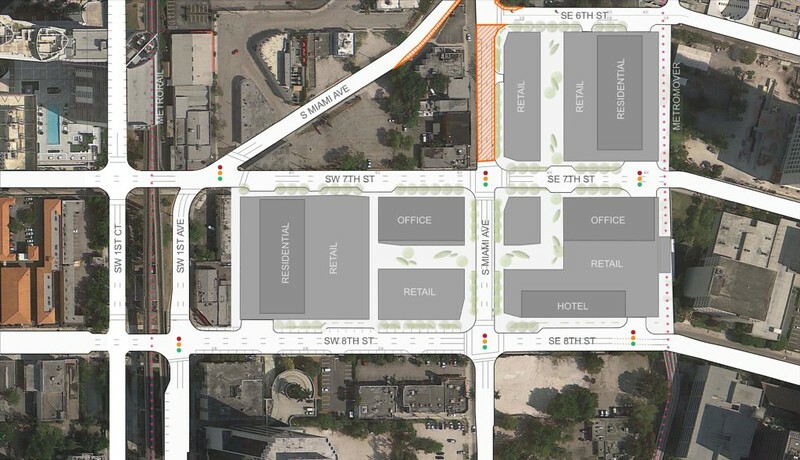 With that in mind, one could argue that Brickell City Centre is a great example of infill transit oriented development. 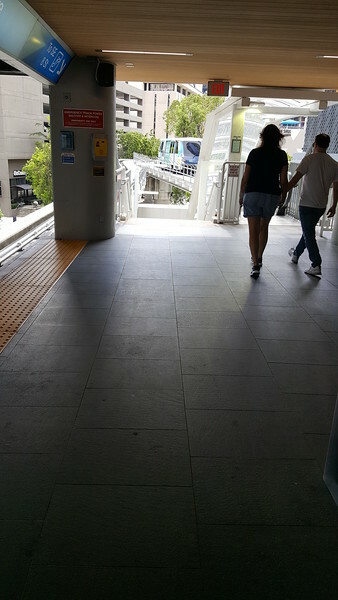 Here, a Miami Metromover station anchors the mall’s east end. 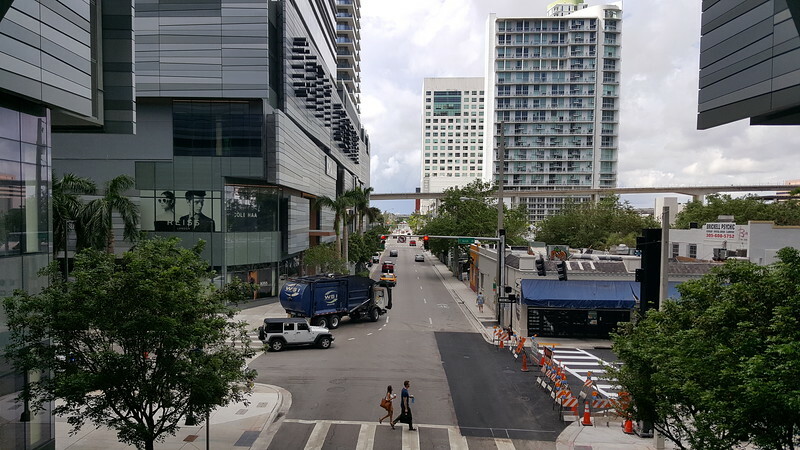 As the city continues to rapidly develop with infill, Brickell City Centre will continue to position itself as a place that’s easily accessible with or without the use of a car.